Bow Street Runner is the first of our 2008 products out of the gate over at Channel 4 Ed! This one's about georgian London - the late 1700s, when early policing methods started to be introduced by the Bow Street magistrates. Covent Garden was a sewer then, all prostitutes and booze and crime; now it's just Stringfellows and fancy pants designer stores. I suppose that's (some) progress...! In the Bow Street Runner game the player becomes one of Fielding’s recruits and must work their way through a series of events in a tough and unruly Covent Garden of the 1750s. Each episode will lead the player to explore different crime scenes, collecting evidence and interviewing characters. Visually the game has a dramatic cinematic effect using a range of digital techniques including 3D sets, dynamic composition and seamlessly integrated live action footage. It's an enjoyable game, although some of the tasks I find impossible with a trackpad/laptop. Looking forward to the next episode. Ouch, trackpad! Good point. We stuck with 'point and click' for this wee 'un, turnaround being what it needed to be, and you're right, point-and-click with a trackpad can be tricksy indeed. I can't be without my tiny weeny laptop travel mouse. I have the Belkin one: it cycles through different colour options. Pure disco, hilarious. Same here Tastycrisp, I get to the 'he went back to Bow Street for a warrant, then just see the 'Loading' animation over and over. Played through twice to this point before giving up... shame, it has loads of promise! Fielding was disappointed with me and my trackpad! Still, what a neat game! Great job on the production values! The systems and mechanics all worked fairly well together for the most part. I missed out on some esteem during the "ease dropping" bit and I had no idea what I had done wrong and how I had missed it. I had a feeling I should do something but nothing happened to make me react. I actually closed my browser when the time was down to 1 min on the 2nd wound out of frustration, lol. I'll go back and give it another go later. Regardless, I'm definitely looking forward to Episode 2. I managed to do all the stitching (it was the top stitch, btw, that was the most frustrating), but now I'm either missing the evidence that links the murderer to the son or I haven't guessed enough to get it right. The obvious clues, at least to me, don't work and I can't combine pieces of evidence. I can't get it to work--it loads and everything, but all I get is a darkened map (of London, I'm guessing). What's going on? 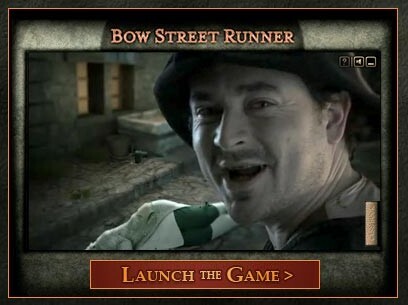 Thanks for all your feedback on our Bow Street Runner game and for helping us dig out all the bugs in the BETA version. Your input has been invaluable and the enthusiasm that we’ve had has really buoyed the team who are currently knee-deep in building the other four episodes. Episode one should now be totally fixed and is fully launched today so give it another go… and since you guys have already had a practise you should get through to episode two with no problems. In this fixed up version your esteem will be carried over to the other episodes… so if you want to be reminded when they’re going live simply leave your email address on the form at the bottom of the game page. That’s it for now… good luck with stitching up the harlot!